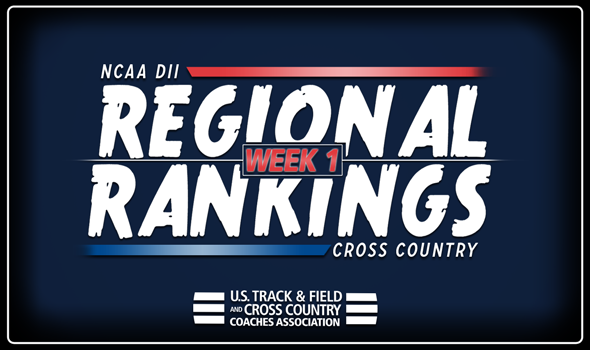 NEW ORLEANS – Despite still being so early in the season there was a lot of movement in the NCAA Division II Cross Country Regional Rankings released Tuesday by the U.S. Track & Field and Cross Country Coaches Association (USTFCCCA). There were two new No. 1 teams named to go with numerous changes in the top-five throughout each region. Remember the top three teams from each regional meeet will automatically advance to the NCAA Division II Cross Country Championships in Pittsburgh, Pennsylvania on December 1. There are also ten at-large selections made by the NCAA Division II Men’s and Women’s Cross Country Committee that will also advance to NCAAs using the following criteria. See below for more information on the rankings, including overviews of each region as well as the full top-15 lists at the bottom of the post. There was a little bit of movement throughout the Atlantic Region from the preseason polls. A new No. 1 was claimed on the men’s side as Edinboro moved into the top spot in the region. They took the place of now No. 2 Shippensburg who fell one spot. No. 3 Charleston saw one of the larger jumps in the poll as they improved four spots from the preseason. Improving one to No. 4 was East Stroudsburg while Lock Haven fell one to No. 5. Edinboro also claimed the top spot on the women’s side with Shippensburg just behind them in No. 2. No. 3 West Chester improved one and traded spots with No. 4 Kutztown. No. 5 East Stroudsburg rounded out the top-five. Just like the Atlantic, the Central Region also saw a good amount of movement in the second poll of the year. Holding the top spot on the men’s side is No. 1 Augustana (S.D.). Following them is No. 2 Missouri Southern who improved one spot, flip-flopping with No. 3 Sioux Falls. No. 4 Minnesota State improved two to move into the top-five while Neb.-Kearney held down the No. 5 rank. On the women’s side the top two spots remained with No. 1 U-Mary and No. 2 Augustana (S.D.). No. 3 Oklahoma Baptist improved one while No. 4 Pittsburg State dropped one in the standings. No. 5 stayed with Southwest Baptist. The trend of lots of movement continues with the East Region. A new No. 1 was named on the men’s side as American International took the top spot. Following behind was No. 2 Stonehill and No. 3 Southern New Hampshire who improved two spots from the previous poll. No. 4 Roberts Wesleyan and No. 5 Southern Connecticut each fell one spot to make up the rest of the top-five. The women’s side of the east didn’t experience as much change as the men as the top four teams in No. 1 Stonehill, No. 2 Roberts Wesleyan, No. 3 Merrimack and No. 4 Assumption remained in their spots. No. 5 Southern New Hampshire moved into the top-five for the first time this season as the program improved one spot from their preseason rank. There wasn’t as much change in the Midwest Region as there was in others as Grand Valley State remained atop of both rankings. On the men’s side the top four team remained the same as the Lakers were followed by No. 2 Southern Indiana, No. 3 Saginaw Valley State and No. 4 Walsh. Moving up one spot and into the top-five was No. 5 Malone. For the women the top two teams remained the same in No. 1 Grand Valley State and No. 2 Hillsdale. The remaining three in the top-five all saw movement as Walsh improved one to No. 3, Southern Indiana fell one to No. 4 and Michigan Tech jumped up one to No. 5. The men’s and women’s side of the South Region were very different in nature. The men’s side received little change as the top two teams, No. 1 Lee (Tenn.) and No. 2 Alabama-Huntsville, remained in the top of the rankings. No. 3 Embry-Riddle traded spots with No. 4 Saint Leo and Florida Southern stayed at No. 5. The women’s side of thing had a ton of changes in the top-five including two of the biggest climbers in the poll this week. No. 1 was still held by Lee (Tenn.) but Tampa improved four spots to No. 2 in the region. Embry-Riddle (Fla.) dropped one to No. 3 while Union shot up five spots to take the No. 4 ranking. Alabama-Huntsville fell two to No. 5. The South Central Region was one of the most calm in this edition of the regional poll. The men’s side saw no change in the top-five as No. 1 Adams State, No. 2 Colorado Mines, No. 3 Western State, No. 4 CSU-Pueblo and No. 5 Dallas Baptist all remained in their rank from the preseason. On the women’s side No. 1 Adams State, No. 2 Western State and No. 3 Colorado Mines all stayed in their previous spots. No. 4 Dallas Baptist and No. 5 UC-Colorado Springs traded places from the last poll. It must be the South as the Southeast Region also had no change to the standings. The men’s side stayed the same as No. 1 Queens (N.C.), No. 2 Mount Olive, No. 3 Augusta, No. 4 Anderson (S.C.) and No. 5 Mars Hill all stayed put. It was the same for the women as the top-five remained with No. 1 Queens (N.C.), No. 2 Mount Olive, No. 3 Anderson (S.C.), No. 4 North Georgia and No. 5 Wingate holding their spots. It wasn’t just the South as the West Region saw just one change overall. The men’s side remained the same with No. 1 Chico State, No. 2 Western Oregon, No. 3 Simon Fraser, No. 4 Alaska Anchorage and No. 5 Cal Poly Pomona. The top four on the women’s side also remained the same with No. 1 Chico State, No. 2 Alaska Anchorage, No. 3 Simon Fraser and No. 4 Cal Poly Pomona. No. 5 Point Loma Nazarene improved two spots to move into the top-five.